Next in the Alphabet Handprint Art Series is the letter W. This week we are sharing a W is for Watermelon craft, just in time for Summer! This craft is great for kindergartners as they learn the letter W. Don’t forget to print the free letter w worksheets to go along with it for more practice. First, print the printable to go along with this craft. 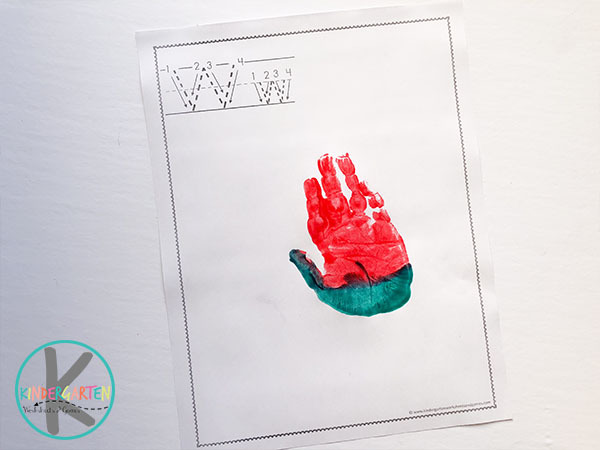 We like to practice the letter on the first page before making the w is for watermelon, and we do the next page while the watermelon handprint is drying. Next, paint the palm with the colors of a watermelon. Start by painting a curved shape at just the base of the hand using green paint. This will be the rind. Next, paint the rest of the hand using red paint. This will be the watermelon flesh. 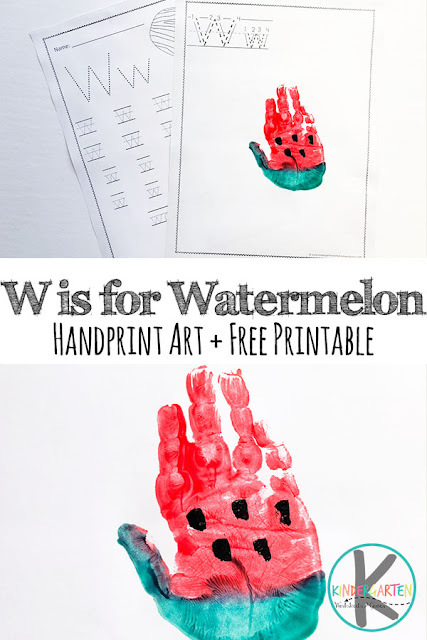 Now it’s time to make w is for watermelon handprint! 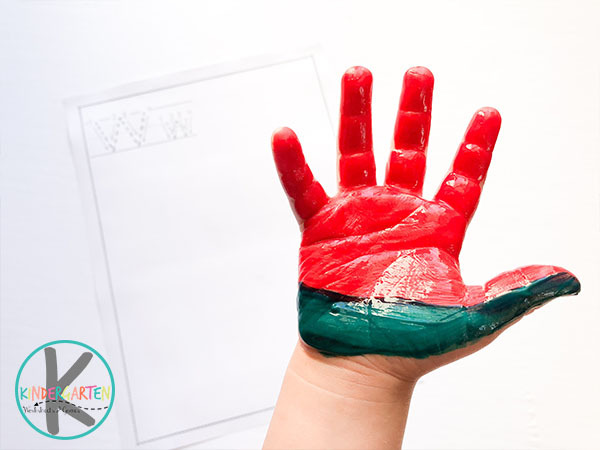 Make a handprint near the center of the page, making sure the fingers are close together, with fingers pointing upwards. It’s best to let this dry before moving to the next step. Use a paintbrush and black paint to make some watermelon seeds. Do this by making a few dots in the red area of the watermelon handprint. 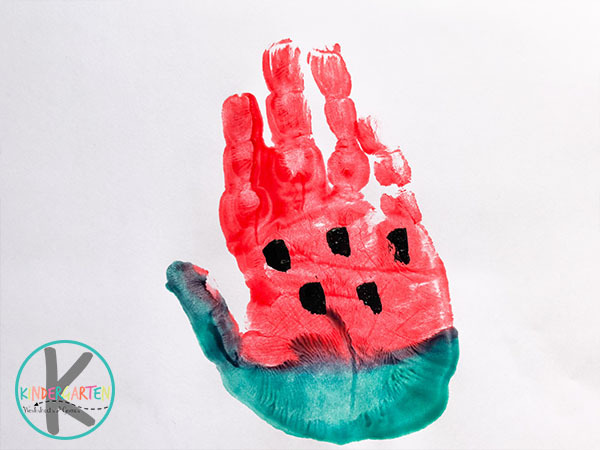 Let dry and then your watermelon handprint is complete! 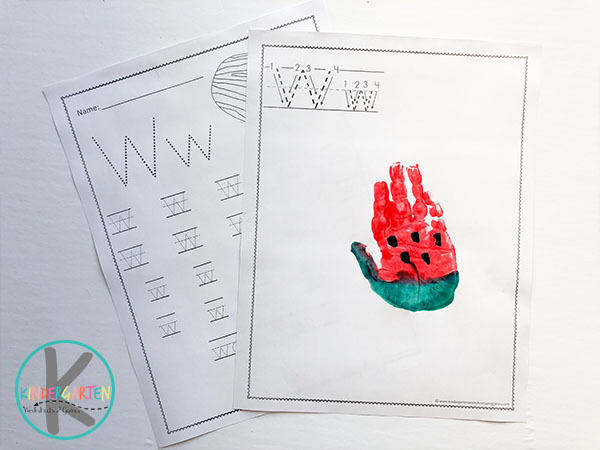 While your watermelon is drying, complete the second page of the “W” is for Watermelon worksheet for more letter “W” practice!